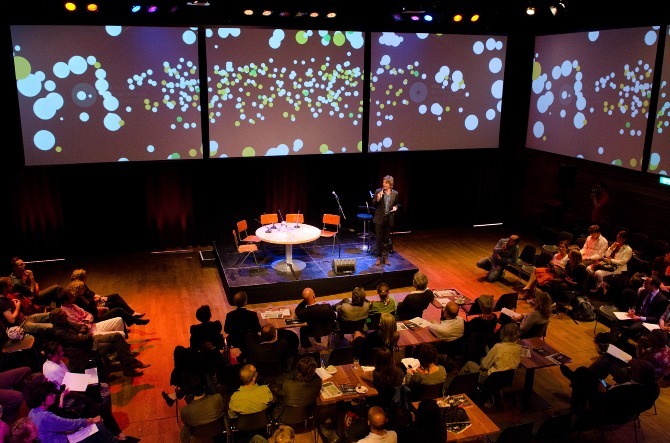 On the 14th of October, an overly crowded talkshow in Pakhuis de Zwijger, over 130 people joined to listen and to young agri & food professionals from all over the world. Hosted by Ikenna Azuike, the young farmers spoke about the future of farming. The evening was kicked off by a pressing message from Ikenna himself: ‘It’s insane that we don’t celebrate farmers and farming more, when you look at everything they do for us! Did you know 70% of the food produced world-wide is produced by small-scale farmers?’ The importance and topic of the night was introduced. Jorrit Kiewik, the director of the Youth Food Movement, is especially fond of his perception that people are eager to learn from each other. ‘That is so powerful!’ As a farmers’ son who works and lives in Amsterdam, he stresses the importance of the older generation making place for the younger ones. The evening was kicked off by a quiz featuring seemingly easy questions. Are you curious whether you can answer them? What is the most popular fruit in the world? Banana or orange? Who produces the most rice? Vietnam or China? How many percentage of the chocolate coming from Africa is processed in Africa? (for the answers, see below). Although there were a two people who made it to the end, most of the food-knowing salon was disappointed and surprised at how fast they dropped out of the race. The quiz made clear that there is still a lot to learn, and facts to know. Bananas are more popular than oranges. China produces more rice. Only 1 per cent of the chocolate coming from Africa, is also processed in Africa.